The powwow has a prominent role in Milwaukee’s cultural life through the Indian Summer Festival, founded in 1986. The contest powwows in the Indian Summer Festival take place over three days and bring in hundreds of Native Americans each year from across the country, as well as many non-native spectators. The term powwow likely comes from the Narragansett term “pau wau,” which means “he or she dreams,” referring to healers and shamans. Powwow changed meanings as European folk-healers appropriated the term and incorporated dance. During the nineteenth century, Native Americans then adapted it to describe a broad celebration of Native culture and dance, often melding traditions of different tribes. The powwow became an important form of cultural expression and “a complicated amalgam of sources and practices reflecting both particular and generalized notions of identity.” The powwow changed in the 1920s as Native soldiers serving in World War I revitalized warrior traditions in response to their experiences. Simultaneously, the Bureau of Indian Affairs repressed dancing and traditional ceremonies, leading to the development of commodified shows for outside audiences. The powwow continued to expand after World War II and became increasingly intertribal, hosting dance contests among different tribes. In 1978, Congress passed the American Indian Religious Freedom Act (AIRFA), allowing Natives to authentically practice their ceremonies. Powwows generally consist of a Grand Entry, prayers, and memorials, but they can differ in their dancing styles and local traditions. Powwows did not occur in Milwaukee until the late 1950s when members of the Potawatomi, Menominee, Ojibwe, and Ho-Chunk started organizing them. After the federal de-recognition of many tribes in the 1950s, hundreds of Native Americans migrated to Milwaukee and sought to stay connected to their cultural roots through the powwow. They became more common in the 1960s and 1970s and began to incorporate more local elements with the typical Plains Indian traditions. The powwows, following the passage of AIFRA, evolved into intertribal events which attracted people from Wisconsin and the Midwest and brought in non-Indian observers. When these events first started in the Milwaukee area, the dancers and drummers were primarily men, but women slowly became more involved. 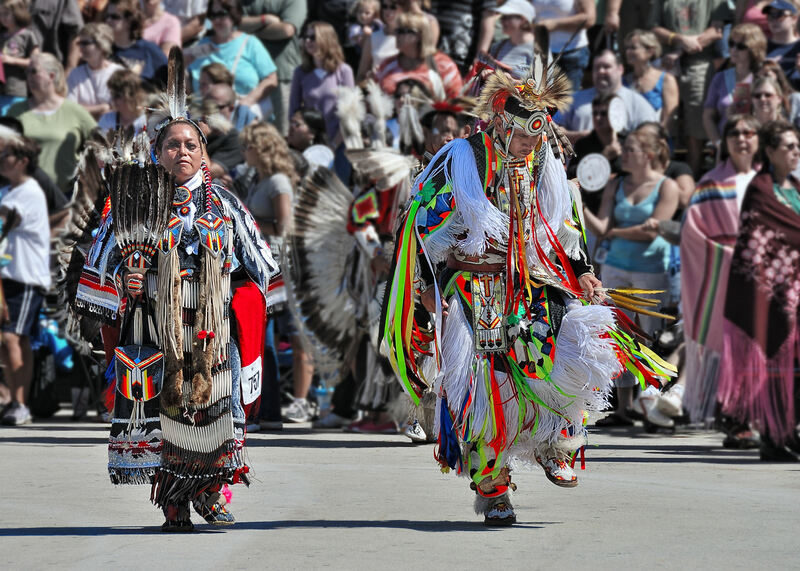 Throughout Milwaukee, powwow dancers engage in fancy dancing, jingle dress dancing, smoke dancing, and grass dancing, often in competitions. Contest powwows act as an important source of revenue for Native American dancers, agencies, and organizations. One of these agencies, the United Indians of Milwaukee, has held powwows since 1979, a year after AIRFA was passed, and their largest one takes place at the State Fair Park in West Allis. ^ Patty Loew, “Urban Indians,” in Indian Nations of Wisconsin: Histories of Endurance and Renewal, 2nd ed. (Madison, WI: Wisconsin Historical Society Press, 2013), 170. ^ Tara Browner, Heartbeat of the People: Music and Dance of the Northern Pow-wow (Urbana, IL: University of Illinois Press, 2002): 27. ^ Browner, Heartbeat of the People, 27-8. ^ Clyde Ellis, Luke E. Lassiter, and Gary H. Dunham, Powwow (Lincoln, NE: University of Nebraska Press, 2005), vii-viii. ^ Grant Arndt, “Ho-Chunk Powwows: Innovation and Tradition in a Changing World,” The Wisconsin Magazine of History 91, no. 3 (2008): 34. ^ Browner, Heartbeat of the People, 28-30. ^ Arndt, “Ho-Chunk Powwows,” 35-7. ^ Suzan Shown Harjo, “American Indian Religious Freedom Act after Twenty-Five Years: An Introduction,” Wicazo Sa Review 19, no. 2 (2004): 129-36. ^ Clyde Ellis, Luke E. Lassiter, and Gary H. Dunham, Powwow (Lincoln, NE: University of Nebraska Press, 2005), vii. ^ Antonio J. Doxtator and Renee J. Zakhar, American Indians in Milwaukee (Charleston, SC: Arcadia Publishing, 2011), 45. ^ Loew, “Urban Indians,” 159-160. ^ Doxtator and Zakhar, American Indians in Milwaukee, 45. ^ Doxtator and Zakhar, American Indians in Milwaukee, 52. ^ Loew, “Urban Indians,” 167. Doxtator, Antonio J., and Renee J. Zakhar. American Indians in Milwaukee. Charleston, SC: Arcadia Publishing, 2011. Ellis, Clyde, Luke E. Lassiter, and Gary H. Dunham. Powwow. Lincoln, NY: University of Nebraska Press, 2005. Loew, Patty. Indian Nations of Wisconsin: Histories of Endurance and Renewal. 2nd ed. Madison, WI: Wisconsin Historical Society Press, 2013. Native American Dance: Ceremonies and Social Traditions. Washington, D.C.: National Museum of the American Indian, Smithsonian Institution, with Starwood Pub., 1992.